Bayer 04 Leverkusen take on SV Darmstadt 98 on Saturday (kick-off: 14:30GMT/15:30CET), looking for the win that could take them back into the top four. Die Werkself were plagued by inconsistency earlier in the campaign, but travel to the Merck-Stadion am Böllenfalltor unbeaten in their last five - including last weekend's gutsy 0-0 draw at home to defending champions FC Bayern München - and trailing fourth-placed FC Schalke 04 by just a point. That said, any optimism coming into this one is likely to be tempered by a DFB Cup quarter-final defeat to SV Werder Bremen in midweek and the injury to star striker Javier 'Chicharito' Hernandez. For promoted Darmstadt, meanwhile, it is largely their performances on the road that have kept them out of relegation trouble thus far. The Lilies left TSG 1899 Hoffenheim's WIRSOL Rhein-Neckar-Arena with their fifth away victory of the campaign on Matchday 20, but have only won a joint-league-low once on their own patch all season. 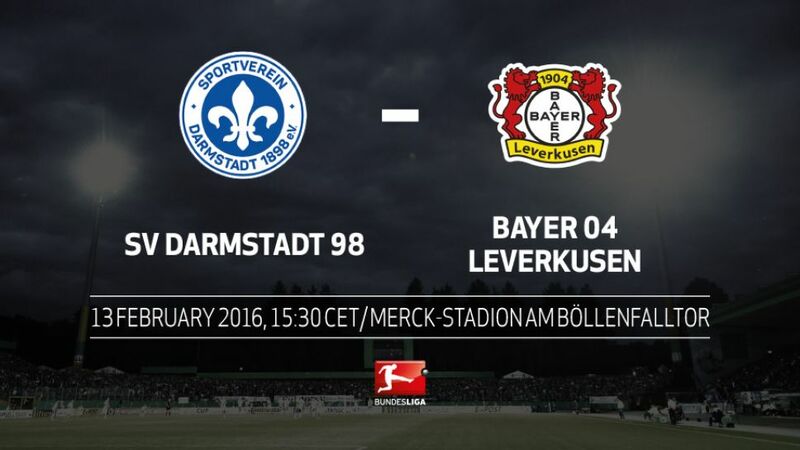 Darmstadt have collected more Rückrunde points (six) than Leverkusen (five).Leverkusen can make it six games without defeat for the first time this season with a positive result in Darmstadt.Bayer have only conceded once in their last five matches and lost two of their last nine.With Ömer Toprak and Jonathan Tah at the heart of the Leverkusen defence in the last eight Bundesliga matches, Die Werkself have only lost once and conceded five.Darmstadt face Leverkusen, Bayern and Borussia Dortmund in three of their next four games. They took four points from the three reverse fixtures during the Hinrunde.Of Darmstadt's ten home games so far this season, the Lilies have won only one (against SV Werder Bremen).Darmstadt have failed to score in their last three home matches in the Bundesliga.Sulu is this season's highest-scoring centre-back with five goals, all of which have come away from home.